Portland was privileged to host a great doctor from Hadassah Hospital in Jerusalem yesterday through the efforts of Hadassah Pacific Northwest and Portland Chapter, November 8th at Jake's Grill in SW Portland. It was a kickoff to re-start the Portland Chapter arranged by Peg Elefant, PNWR President and Diana Lindemann, member. 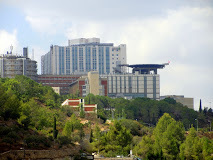 He showed us a slide of Hadassah Hospital and the neighborhood nearby, which was where Palestinian Arabs were living. 1/3 of them were terrorists during this Jerusalem rioting of the past several weeks and were providing the danger that the medical staff had to beware of in getting to work. Some others from this area were either patients or medical staffers working at the hospital. 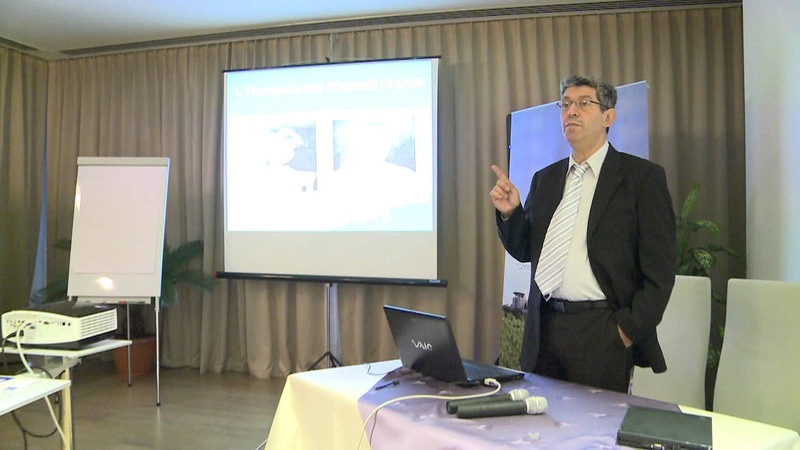 Dr. David Zangen, a senior pediatrician at Hadassah Hospital as well as medical researcher spoke about Diabetes and disorders of sexual development to a group of Hadassah members of about 40 from several parts of Oregon. Zangen is in Pediatrics, but that extends to the age of 29 in helping people with the condition. His findings are helping adults as well. He not only has had dealings with researchers here in the field, but is also noted in Israel for his service as captain in the IDF and was a Major and Chief Medical Officer in his Brigade. David Pasternack joined Hadassah in 2014 to oversee all fundraising efforts. He was unable to travel with Dr. Zangen this time though he had planned to, but has orchestrated doctor, dignitary and leadership visits throughout the Nation to spread Hadassah's message of healing, teaching and research. Behind the program planning and organizing it was Harriett Zeitlin, Director of Development for Hadassah Western Regions. Dr. Zangen showed videos of the development of finding out what the causes of diabetes were and how they have found ways of changing the cells in order for patients to not have to have insulin shots, but to take medication, instead. 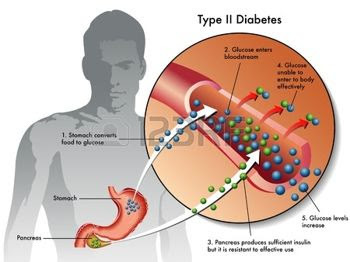 When a person with diabetes eats a sugary food, the sugar is not used properly, and they have learned to close the door or open the door of their pancreas. What I learned as a layperson without actual experience with diabetes is that sugar is necessary to feed the brain. Without it, the brain can die, and thus we do. And here I've been avoiding sugar as much as possible! We relished the fresh strawberries Jake's Grill served that were so sweet! I felt relieved! I have more admiration for Zanger than ever from his military days in 2002 during the days of the 2nd Intifada when he became a spokesman for the IDF against charges that were lies (as usual). Entering the camp was part of Operation Defensive Shield, a time the Palestinians were overtly attacking Israelis. Jenin refugee camp ""served as a launch site for numerous terrorist attacks against both Israeli civilians and Israeli towns and villages in the area. " Zangen had been a doctor of the brigade that fought in the Jenin refugee camp which was under the Palestine Authority of Abbas, from April 1-11, 2002 and had treated many of the wounded. Most of the IDF were reserve soldiers and were all very careful. 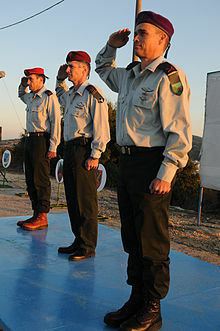 The Unit and Divisional Commanders fighting were the best of the Israeli people. 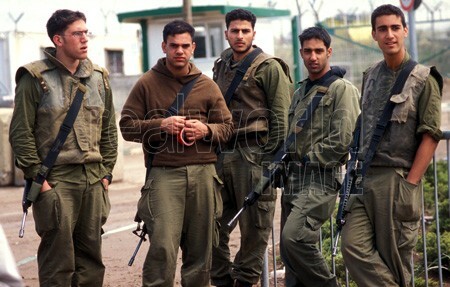 What impressed the doctor was that they kept the IDF alive and did not lose their humanity. The paramedics and Zangen risked their lives to treat the wounded Palestinians. They even bothered to treat the sick Arabs they came across. The Palestinian doctors didn't come to their aid and of course the Israeli medics couldn't leave them without medical treatment. The soldiers brought over a girl of Jenin to the doctors with appendicitis and they treated her. Another case was a child with a neck wound and they saved his life in spite of his Islamic Jihad tattoo. Every Palestinian were provided with full treatment that made him proud. They kept civilian casualties down by administering to them. Then, the UN Special Envoy to the Middle East, Terje Larsen, called the Jenin situation a "Massacre carried out by the Israelis in Jenin that were such lies and infuriated Dr. Zanger. The doctor had seen everything with his own eyes close at hand. He saw how the soldiers did everything it could to prevent civilian casualties. The IDF could have resorted to aerial bombardment or heavy artillery like other armies might have. If they had done that, they would have reached their mission in half a day without suffering any of their own casualties, but that's not what they did. They took risks of their own lives in the fighting in trying to rescue those innocent civilians caught in the battle. He said, "Anyone who says that Israel carried out a massacre is lying and inciting the Arabs. Instead of acting to bring about reconciliation and peace, Larsen is creating hatred." Why is it that this "Norwegian diplomat, politician and sociologist had to make out that Israel was acting in such ways? We expect better from such an educated man. I'm wondering if the fact that Norway has not been backing Israel has something to do with it. A country always at odds with Sweden, my grandmother used to say, "Oh...those Norwegians, and shake her head sadly." Sweden did house Jewish refugees from WWII, but of late has been accepting Muslim refugees that have been busy attacking the Jews in Malmo, causing them to finally move to Israel. Norway is known to be anti-Semitic. Their thinking is contrary. "In a recent interview, Norway's Ambassador to Israel has suggested that Hamas terrorism against Israel is more justified than the recent terrorist attack against Norway. His reasoning is that, "We Norwegians consider the occupation to be the cause of the terror against Israel." In other words terrorism against Israeli citizens is the fault of Israel." Israel is not "OCCUPYING." Countries can't get that through their heads. Israel is not occupying Gaza. Jews were living there. The government forced them to leave in order to have a peaceful solution. Then the terrorists took over and turned it into a launching pad of rockets, mortars and missiles against Israel. Israel is not occupying Judea or Samaria. They have Jews who live in there, and remember, this was the original site of ancient Israel and Judea, an area very close to the hearts of all Jews. What Israel did this time is allow the PA to be the administrators. The land is divided into areas of A, B, and C according to the Oslo Accords. C is Jewish land. A is Arab land. B is to be shared. "Numerous legal authorities dispute the charge that Jewish neighborhoods and towns are “illegal.” Stephen Schwebel, formerly President of the International Court of Justice, notes that a country acting in self-defense may seize and occupy territory when necessary to protect itself. Schwebel also observes that a state may require, as a condition for its withdrawal, security measures designed to ensure its citizens are not menaced again from that territory. According to Eugene Rostow, a former Undersecretary of State for Political Affairs in the Johnson Administration,Resolution 242 gives Israel a legal right to be in Judea and Samaria. The resolution, Rostow noted, “Israel is entitled to administer the territories” it won in 1967 until ‘‘a just and lasting peace in the Middle East’’ is achieved. Though critical of Israeli policy, the United States does not consider settlements illegal." I imagine that this Larsen had never been there, was relying on Arab reports, and even if he was there, would not know what he was seeing and could not understand anything amid the frenzy of battle. The doctor was a trained soldier as well. He knew what he was seeing. I have a feeling that Larsen spun enough incitement to cause Norway to be most known as a well known anti-Semitic country. Strange since young female Scandinavians like to go to Israel in the winter to sun bathe and swim. Zangen reported that only a few dozen homes had been destroyed, homes that had been booby-trapped in order to kill entering soldiers. Jenin had been a fortress of terrorism. 200 terrorists wired up the camp with booby-traps. They had taken control of the camp and were recruiting suicide bombers at every opportunity. A 1/3 of the suicide bombers have come from the Jenin refugee camp. They found photo albums with pictures of children wearing explosive belts; studio photos of future martyrs "shahidim", and teens from 16 to 18 who wanted to kill Israelis in suicide attacks. In all the homes they found that walls were covered wall to wall with pictures of martyrs. Martyrs are these people's heroes. Thank goodness a respected doctor who was an eye witness spoke out against the false allegations of Mr. Larsen.